Hi there! Today I will tell you of the survey OSSOS, which I already mentioned in the past. This survey made systematic observations of the sky to detect Trans-Neptunian Objects (TNOs), between 2013 and 2017. It was indeed a success, since it tripled the number of known TNOs. Its results are presented in OSSOS. VII. 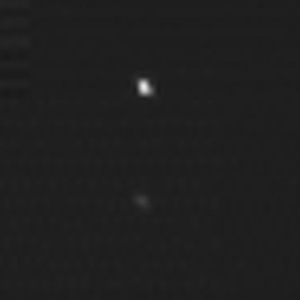 800+ Trans-Neptunian Objects — The complete Data Release, led by Michele Bannister. This study is published in The Astrophysical Journal Supplement Series. The Deep Ecliptic Survey has been operating between 1998 and 2003, using two 4-m telescopes of the National Optical Astronomy Observatory: the Mayall telescope at Kitt Peak Observatory (Arizona, USA), and the Blanco telescope at Cerro Tololo Inter-American Observatory (Chile). 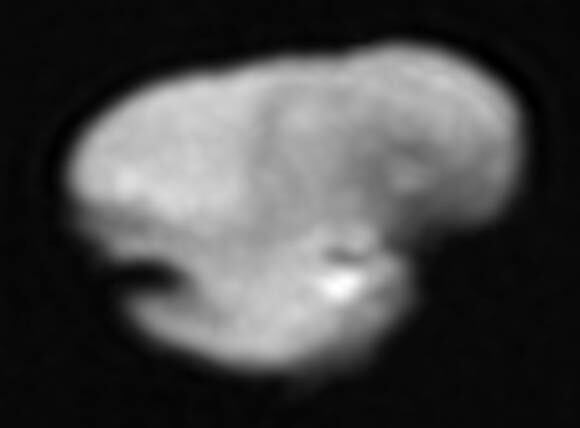 It discovered 382 TNOs, including some Centaurs, which actually orbit inner to the orbit of Neptune. It covered 550 square degrees with sensitivity of 22.5. This survey operated between early 2003 and early 2007, at the Canada-France-Hawaii Telescope (Hawaii, USA). It covered 321 square degrees with sensitivity of 24.4, and permitted to classify 169 TNOs. By classifying, I do not mean only discover, but also know their orbits with enough accuracy to determine to which dynamical group they belong. I will go back on this point later, but my meaning is that observing an object once is definitely not enough. This survey was limited to the detection of objects with a small inclination with respect to the ecliptic plane, i.e. the orbit of the Earth. It was then extended by the High Ecliptic Latitude (HiLat) component, which looked for objects with significant inclinations. It examined 701 square degrees of sky ranging from 12° to 85° ecliptic latitude and discovered 24 TNOs, with inclinations between 15° and 104° (from Petit et al., 2017, The Canada-France Ecliptic Plane Survey (CFEPS) — High-latitude component, The Astronomical Journal, 153:5. 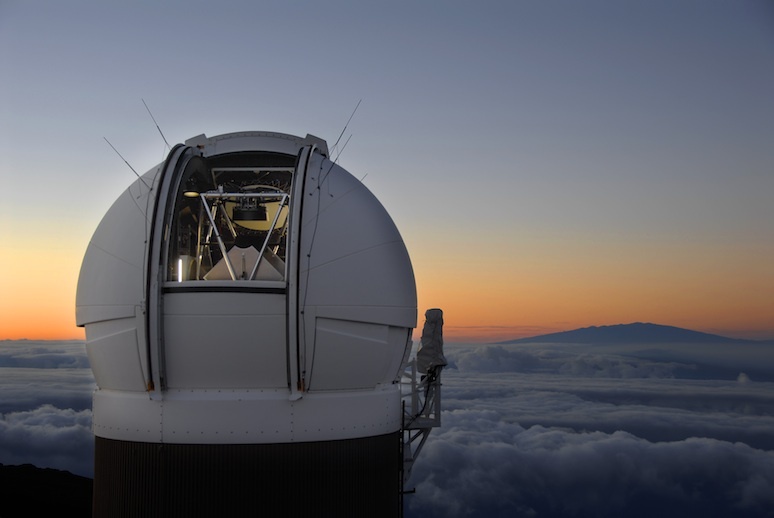 The Panoramic Survey Telescope and Rapid Response System (Pan-STARRS1) survey operates from Haleakala Observatory, Hawaii, USA since 2010. It is not specifically devoted for TNOs, but for moving objects (asteroids, stars,…), and is particularly known for the discovery of the first known interstellar object, i.e. 1I/’Oumuamua. It discovered 370 new TNOs, but without enough information to securely classify their orbits. OSSOS operated between 2013 and 2017 from the Canada-France-Hawaii Telescope, taking more than 8,000 images. It covered 155 square degrees with a sensitivity up to 25.2. This coverage has been split into 8 blocks, which avoided the Galactic plane. The study I present today is the complete data release, in which 838 objects are given without ambiguity on their orbital classification. This was an international collaboration, involving Canada, UK, France, Taiwan, USA, Finland, Japan, Slovakia,… but also involving different skills, like orbital characterization, astrometry, chemistry, cometary activity, data mining, etc. In other words, it not only aimed at discovering new objects, but also at understanding their orbital dynamics, their physics, and if possible their origin. In the previous paragraphs I pointed out the difference between discovering an object, and classifying it following its orbit. Let us see that now. As we will see in the next paragraph, the Trans-Neptunian population is composed of different parts, following the orbits of the objects and the perturbations acting on them, i.e. the gravitational attraction of the giant planets. Classifying a newly discovered object requires some accuracy in the determination of its orbit. The following is a summary of how things work. For an object to be discovered, it must appear on a triplet of images, which cover a timespan of about 2 hours. From it the relative motion of the object on the sky can be evaluated, which would permit to reobserve it. The new observations permit themselves to better constrain the orbit. The OSSOS team announces that an arc of observations of about 16 months is required to have enough confidence in the orbit. In many cases the arc is longer, actually the team tells us that for the 838 classified objects, astrometric measurements have been made over 2 to 5 oppositions. An opposition is the geometric alignment between the Sun, the Earth, and the object. For an astrometric measurement to be accurate, you need to accurately know the positions of the other objects present on the image. These other objects are stars, which are referenced in astrometric catalogues. The astrometric satellite Gaia is currently performing such a survey. Its Data Release 2 has very recently (April 2018) been released, but this was too late for the present study. So, the authors used the Data Release 1, and the Pan-STARRS 1 catalogue when necessary. In some cases, objects were lost, i.e. the authors were not able to reobserve it. This may have been due to the lack of accuracy of the orbital determination from the discovery arc, or just because the object left a covered zone. Before giving you the results, I should tell you something on the structure of the outer Solar System. I mentioned orbital classification above, the classes are coming now. First, we should make a distinction between resonant and non-resonant orbits. Resonant orbits are in mean-motion resonance with a planet, which is mostly Neptune. For instance, the 2:1 resonance with Neptune means that Neptune accomplishes two revolutions around the Sun while the object makes exactly one. Such a ratio implies amplified dynamical effects on the object, which may excite its eccentricity or its inclination, destabilize or confine its orbit. 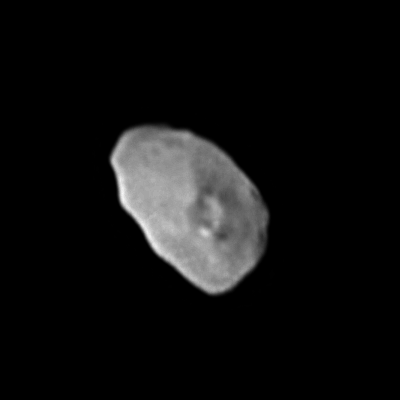 Inner-belt objects: here the belt is the Kuiper Belt, not to be confused with the Main Asteroid Belt between Mars and Jupiter. This objects orbit between the orbit of Neptune and the 3:2 resonance, i.e. the orbit of Pluto, at 39.4 AU. Main-belt objects: between the 3:2 and the 2:1 resonance, i.e. between 39.4 and 47.7 AU. Outer-belt objects: they orbit beyond the 2:1 resonance and have an eccentricity smaller than 0.24. Detached objects: not only they orbit beyond the 2:1 resonance, but also have an eccentricity larger than 0.24. As a consequence, they may have very large semi-major axes, but could be detected since their perihelion distance, i.e. their closest distance to the Sun, is accessible to our terrestrial instruments. This is made possible by their high eccentricity. Among these objects are the eTNOs (e for extreme) mentioned here. 1,142 TNOs (including Centaurs) are now classified, 838 of them thanks to OSSOS. Among these 838 objects, 313 are resonant, including 132 in the 3:2 resonance, 39 in the 7:4 and 34 in the 2:1, and 525 are non-resonant. 421 of the non-resonant object are in the main belt, i.e. between the 3:2 and the 2:1 resonances. securely occupied resonances exist at least up to 130 AU, which is the location of the 9:1 resonance. The word origins appear in OSSOS. Actually, knowing the distribution of the Kuiper Belt Objects tells us something on the evolution of our Solar System. The OSSOS team provides software, which include a survey simulator, checking the relevance of a predicted model for the Kuiper Belt, when compared to the observations. and the webpage of Shiang-Yu Wang. Hi there! Today I present you the discovery of a Trans-Neptunian Object, you know, these objects which orbit beyond the orbit of Neptune. And I particularly like that one, since its orbit resonates with the one of Neptune. Don’t worry, I will explain you all this, keep in mind for now that this object is probably one of the most stable. 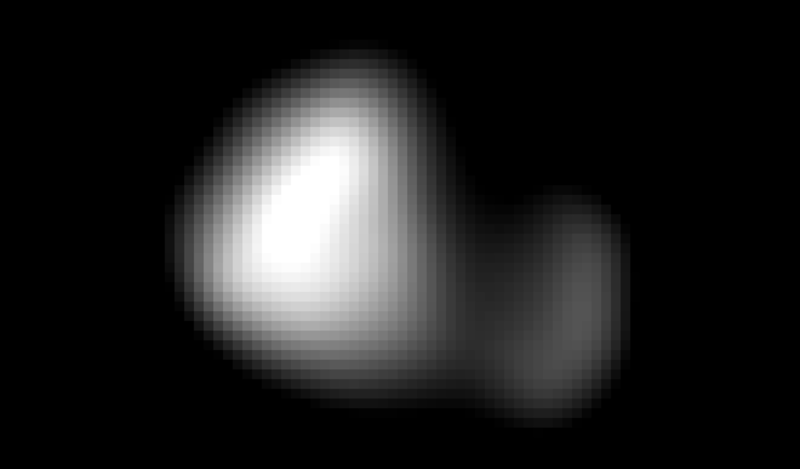 Anyway, this is the opportunity to present you A dwarf planet class object in the 21: 5 resonance with Neptune by M.J. Holman and collaborators. This study has recently been accepted for publication in The Astrophysical Journal Letters. The Trans-Neptunians Objects are small bodies, which orbit beyond the orbit of Neptune, i.e. with a semimajor axis larger than 30 AU. The first discovered one is the well-known Pluto, in 1930. It was then, and until 2006, considered as the ninth planet of the Solar System. It was the only known TNO until 1992. While I am writing this, 2482 are listed on the JPL small-body database search engine. The TNOs are often classified as the Kuiper-Belt objects, the scattered disc objects, and the Oort cloud. I do not feel these are official classifications, and there are sometimes inconsistencies between the different sources. Basically, the Kuiper-Belt objects are the ones, which orbits are not too much eccentric, not too inclined, and not too far (even if these objects orbit very far from us). The scattered disc objects have more eccentric and inclined orbits, and these dynamics could be due to chaotic / resonant excitation by the gravitational action of the planets. And the Oort cloud could be seen as the frontier of our Solar System. It is a theoretical cloud located between 50,000 and 200,000 Astronomical Units. Comets may originate from there. Its location makes it sensitive to the action of other stars, and to the Galactic tide, i.e. the deformation of our Galaxy. 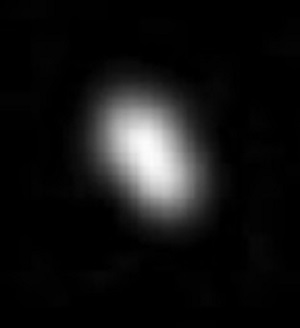 The object I present you today, 2010 JO179, could be a scattered disc object. It has been discovered in 2010, thanks to the Pan-STARRS survey. Pan-STARRS, for Panoramic Survey Telescope and Rapid Response System, is a systematic survey of the sky. Its facilities are located at Haleakala Observatory, Hawaii, and currently consist of two 1.8m-Ritchey–Chrétien telescopes. 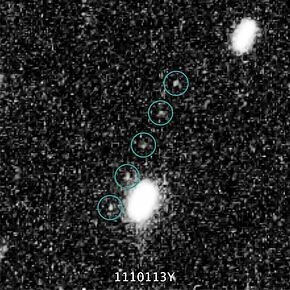 It operates since 2010, and discovered small Solar System objects, the interstellar visitor 1I/’Oumuamua… It observes in 5 wavelengths from infrared to visible. The data consist of high-accuracy images of the sky, containing a huge amount of data. Beyond discoveries, these data permit an accurate astrometry of the object present on the images, which is useful for understanding their motion and determining their orbits. They also allow a determination of the activity of variable objects, i.e. variable stars, a study of their surface from their spectrum in the five wavelengths, and (for instance) the measurement of their rotation. A very nice tool anyway! Pan-STARRS delivered its first data release in December 2016, while the DR2 (Data Release 2) is scheduled for mid-2018… pretty soon actually. Among the discovered objects are the one we are interested in today, i.e. 2010 JO179. The first observation of 2010 JO179 dates back from May 2010, and it has been detected 24 times during 12 nights, until July 2016. The detections are made in comparing the Pan-STARRS data from the known objects. Once something unknown appears in the data, leaving what the authors call a tracklet, its motion is extrapolated to predict its position at different dates, to investigate whether it is present on other images, another time. From 3 detections, the algorithm makes a more systematic search of additional tracklets, and in case of positive additional detection, then an orbit is fitted. The orbital characteristics (and other properties) are listed below. You can notice the high accuracy of the orbital parameters, which almost looks like a miracle for such a distant object. This is due to the number of detections, and the accuracy of the astrometry with Pan-STARRS. Once an object is discovered, you know where it is, or at least where it is supposed to be. 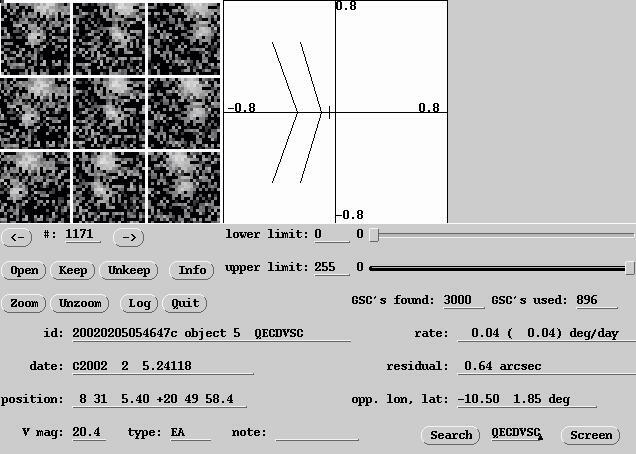 Thanks to this knowledge, it was possible to detect 2010 JO179 on data from the Sloan Digital Sky Survey, taken in New Mexico, and on data from the DECalS survey, taken in Chile. Moreover, 2010 JO179 was intentionally observed with the New Technology Telescope (NTT) in La Silla, Chile. The spectroscopy (analysis of the reflected light at different wavelengths) of 2010 JO179 revealed a moderately red object, which is common for TNOs. This is something I have already evoked in previous articles. When you record the light flux reflected by the surface of a planetary body, you should observe some periodic variability, which is linked to its rotation. From the observations, you should extract (or try to) a period, which may not be an easy task regarding the sparsity and the accuracy of the observations. In using the so-called Lomb-Scargle algorithm, the authors detected two possible periods, which are 30.6324 hours, and 61.2649 hours… i.e. twice the former number. These are best-fits, i.e. you try to fit a sinusoid to the recorded light, and these are the periods you get. The associated amplitudes are variations of magnitude of 0.46 and 0.5, respectively. In other words, the authors have two solutions, they favor the first one since it would imply a too elongated asteroid. Anyway, you can say that twice 30.6324 hours is a period as well, but what we call the spin period is the smallest non-null duration, which leaves the light flux (pretty) invariant. So, the measured spin period of 2010 JO179 is 30.6324 hours, which makes it a slow rotator. Let us make a break on the specific case of 2010 JO179 (shall we give it a nickname anyway? ), since I would like to recall you something on the mean-motion resonances before. When two planetary bodies orbit the Sun, they perturb each other. It can be shown that when the ratio of their orbital periods (similarly the ratio of their orbital frequencies) is rational, i.e. is one integer divided by another one, then you are in a dynamical situation of commensurability, or quasi-resonance. A well known case is the 5:2 configuration between Jupiter and Saturn, i.e. Jupiter makes 5 orbits around the Sun while Saturn makes 2. In such a case, the orbital perturbations are enhanced, and you can either be very stable, or have a chaotic orbit, in which the eccentricities and inclinations could raise, the orbit become unpredictable beyond a certain time horizon (Lyapunov time), and even a body be ejected. Mathematically, an expansion of the so-called perturbing function, or the perturbing mutual gravitational potential, would display a sum of sinusoidal term containing resonant arguments, which would have long-term effects. These arguments would read as pλ1-(p+q)λ2+q1ϖ1+q2ϖ2+q3Ω1+q4Ω2, with q=q1+q2+q3+q4. The subscripts 1 and 2 are for the two bodies (in our case, 1 will stand for Neptune, and 2 for JO 2010179), λ are their mean longitudes, ϖ their longitudes of pericentres, and Ω the longitudes of their ascending nodes. In a perturbed case, which may happen for high eccentricities and inclinations, resonances involving several arguments may overlap, and induce a chaotic dynamics that could be stable… or not. You need to simulate the long-term dynamics to know more about that. It appears that Neptune and 2010 JO179 are very close to the 21:5 mean-motion resonance (p=5, q=16). To inquire this, the authors ran 100 numerical simulations of the orbital motion of 2010 JO179, with slightly different initial conditions which are consistent with the uncertainty of the observations, over 700 Myr. And they saw that 2010 JO179 could be trapped in a resonance, with argument 5λ1-21λ2+16ϖ2. In about 25% of the simulations, JO179 remains trapped, which implies that the resonant argument is librating, i.e. bounded, all over the simulation. As a consequence, this suggests that its orbit is very stable, which is remarkable given its very high eccentricity (almost 0.5). and the one of Richard Wainscoat.